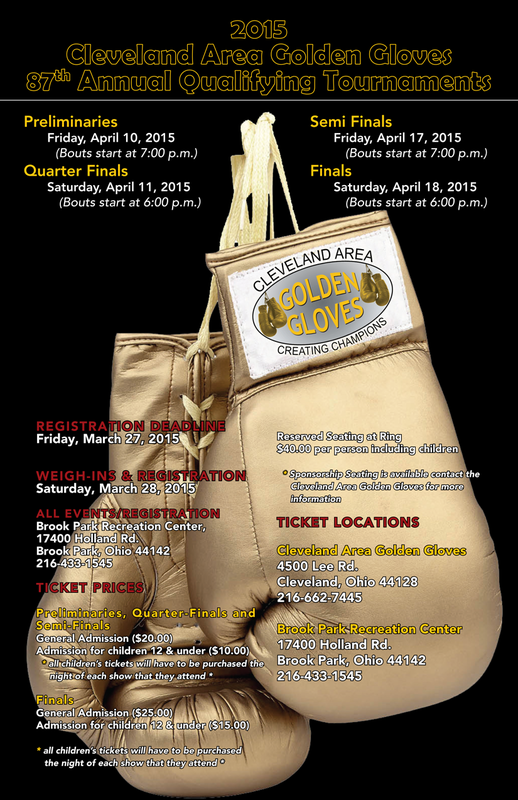 The 87th annual Cleveland Area Golden Gloves tournament gets underway this weekend at the Brook Park Recreation Center, 17400 Holland Rd in Brook Park. The preliminary bouts will begin Friday, April 10th at 7PM with the quarterfinals taking place on Saturday at 6PM. Among the storylines for this year’s tournament are the number of former Cleveland Golden Glove Champions that will be in action. The 132, 178, and 201 pound Open Division all will have three former champions each competing to add more hardware to their trophy case along with being a part of the Cleveland team that will travel to Las Vegas, Nevada in May for the right to become a National Champion. At 132 pounds, Zi Stalnaker, who trains at Terminator Boxing Club in Akron should be familiar to those who attended last year’s tournament as he was the Novice (between 1-9 bouts of experience) Division champion in 2014 and has now moved up to the Open (10+ bout of experience) Division. He’ll be joined by a couple of former Sub Novice (No experience) champions in Frank Brown from the Westside Boxing Club in Cleveland, who won in 2012 and Elhan Nevzadi from Bob Davis Boxing Club in Cleveland, who won in 2010 at 125 pounds. The 178 pound Open Division will be highlighted by the defending champion, Octavius Webb. Other former champions at 178 pounds are two-time champion Ronnie Pratt from Empire Boxing Club/Zelma George Rec Center in Cleveland, who is looking to add the Open Division title to his resume after being crowned the 2013 Sub Novice Division Champion at 165 pounds and the 178 pound Novice Division Champion last year in this weight class. Matt Brown from Terminator Boxing Club in Akron was the 2009 Novice Champion at 165 pounds. The 201 pound Open Division will feature 2012 Novice Division Champion Kato Montgomery from Bob Davis Boxing Club, 2013 Novice Division Champion Roney Hines, also from Bob Davis Boxing Club, and 2013 Sub Novice 178 pound Champion Darion Peterson from Old School Boxing Club/StrongStyle Fight Team in Independence. Both fighters competing for the 141 pound Open Division title are former champions. Marty Adams from Iron Fist Boxing in Cleveland is the defending Novice Division Champion, while William Flenoy from Cleveland PAL/Thurgood Marshall Rec Center is a two-time champion, winning the 125 Open Division in 2008 and the 132 pound Open Division in 2011. Isaiah Steen has been crowned the best at 152 pounds in the Open Division the last two years. Daywaun Roseberry from Iron Fist Boxing was the 2012 Novice Division Champion and will look to add an Open Division Title of his own. The 165 pound Open Division will feature former Champions Fred Wilson Jr from Cleveland Inner City Boxing Academy, the 2012 and 2014 Open Division Champion as well as Levi Patterson from Empire Boxing Club/Zelma George Rec Center, who was the 2011 Open Division champion at 152 pounds. Two former champions will add 2015 champions after their name as they will be uncontested in this year’s tournament. Aurel Love from Bob Davis Boxing Club is the defending 114 pound Open Division Champion and Alante Green from Empire Boxing Club/Zelma George Rec Center was the 2012 Sub Novice and 2014 Open Division champion at 201+ pounds.